I had the pleasure of staying at The Royal Horseguards (Twitter: @horseguardsLDN, Facebook: The Royal Horseguards Hotel) for a night during my stay in London two weeks ago. When the taxi dropped my friend Mijune and I off at the front I honestly did a double-take. Seriously? I'm actually staying here? The place was so grand, so stunning. The Royal Horseguards is simply breathtaking! It's safe to say that I've never stayed at a hotel as majestic as The Royal Horseguards. This five-star luxury hotel with its glittering chandeliers, outstanding views and fully refurbished Victorian elegance is marvelous. The interior combines the grandeur of a Victorian castle with contemporary style and design. And here's a cool fact: The Royal Horseguards actually served as the headquarters of the Secret Service during the First World War! Gorgeous chandeliers can be found throughout the hotel. The Royal Horseguards' elegant lobby. It was also at The Royal Horseguards that I had my first afternoon tea experience in London. I was really excited for it because more than anywhere else, London is synonymous with Afternoon Tea! There's no argument that the post-lunch, pre-dinner treat is a British institution. Having been accredited with ‘invitation only’ membership to the esteemed UK Tea Guild in 2012, The Royal Horseguards was honoured with its second ‘Award of Excellence’ in the Tea Guild’s Top London Afternoon Tea Awards in 2013 (The Tea Guild is a prestigious and unique non-profit organisation that represents and encourages those outlets who are dedicated to both brewing and serving tea to the high standards desired by the United Kingdom Tea Council). The Royal Horseguards' Novus Tea menu offers a broad range of black, green and herbal infusions from the world’s premium tea estate using only the finest quality leaf grades. Mijune and I chose "Strawberries & Cream", a Royal Horseguards unique blend of black leaf teas which was light in flavour with subtle strawberry and cream notes, and "English Breakfast", a black tea blend of delicate Ceylon, gutsy Assam and rounded off with a tasty South Indian leaf. And here it is, The Royal Horseguards' Signature Afternoon Tea. Coronation Chicken, Cream Cheese & Smoked Salmon, Hummus & Cucumber and Roast Beef and Horseradish. These finger sandwiches were perfectly sized. My favourites were the cream cheese & smoked salmon, and the coronation chicken which was packed with herbs and spices in a nice creamy sauce. To ensure freshness, the scones were brought out only after we were done our sandwiches. These scones are quite possibly the best scones I've ever had so far in my life. Served warm, they had a medium-gold outer crust and a light-gold, moist and tender crumb. The entire scone was light and buttery with a cake-like denseness and texture. I needed a lot of restraint when it came to the clotted cream because I wanted lots of it on my scone. It was ridiculously smooth, thick and creamy (clotted cream is a thick cream made by indirectly heating full-cream cow's milk using steam or a water bath and then leaving it in shallow pans to cool slowly). Lemon Cupcakes with Marshmallow Meringue, Banana Toffee Cheesecake, Creme Brulee and Darjeeling Chocolate "shot glasses", Mango Passion Fruit Tart, Raspberry Meringue Lollipops and Macarons. The banana toffee cheesecake and the creme brulee and Darjeeling chocolate "shot glass" were the highlights for me from the sweets plate. Attentive service combined with its great afternoon tea and comfortable setting makes The Royal Horseguards a superb afternoon tea spot. Guests enjoying afternoon tea will never leave hungry too as their Afternoon Tea is continuously replenished at no additional charge. .It also had a marvelous view over the River Thames. Fully equipped with a vanity set, an iPod docking station with Bose surround sound, a plasma TV, international plug sockets, and free wireless broadband internet access, my room has everything that any traveler would ever need. Even the room safe has a built-in plug socket so your electronics can be charged at the same time. 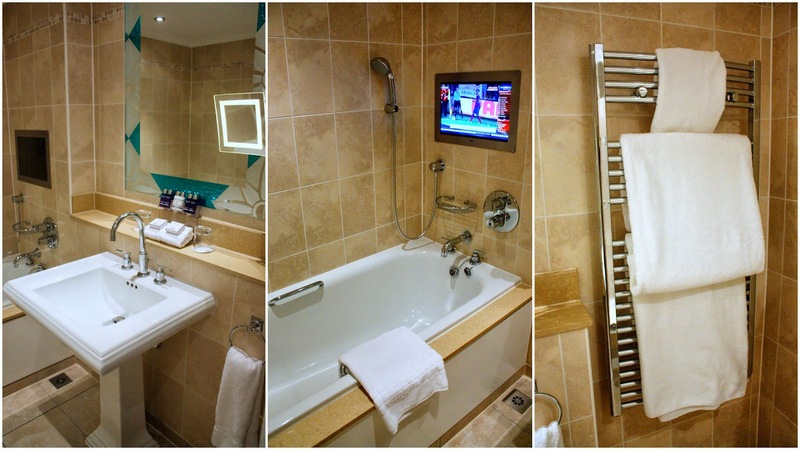 Oh ya, there's also a plasma TV in the bathroom. Now this is a legit five-star experience, baby! The Royal Horseguards, in its central location, is very convenient. 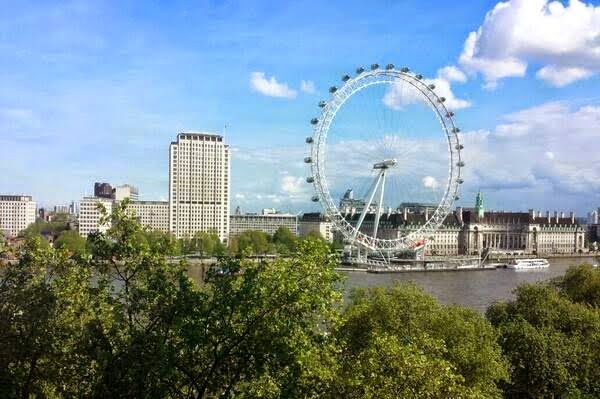 With just a 5 minute walk to the subway tube station, the hotel is close to Embankment tube, Charing Cross station, Waterloo station, Embankment Pier river taxis and London City Airport by DLR. It is also close to London landmarks such as The London Eye, Trafalgar Square, Parliament Square and Royal Parks. Thank you, The Royal Horseguards, for such a wonderful stay. I can't wait to be back!